This week the social media has been awash with a video clip in which two men alleged that Democratic Progressive Party (DPP) Vice President for the South and Minister of Local Government, Kondwani Nankhumwa’s real name is George Malemia. The men further alleged that he started using the name Kondwani Nankhumwa after ‘inheriting’ his deceased brother’s academic certificates. This is not the first time this allegation has come out. Of all people, why Nankhumwa? Of all the names why George Malemia? Only Nankhumwa can explain this. Credit to Nankhumwa, he came out this week and issued a statement on the matter on Facebook. However, in trying to refute the allegations, he demonstrated that he is an accomplished liar. His statement can’t go without scrutiny, not only because of the lies and propaganda, but also because with the poverty of leadership in DPP, Nankhumwa is one of the proverbial swiswiris (mbewa zikatha amanona ndi swiswiri) that are being considered for DPP running mate position in the 2019 elections. Malawians need to know the depth and credibility of people who are jostling for the country’s leadership. In his Facebook statement, Nankhumwa said, “As you are all aware that in all my political meetings I have tried to advance issue-based politics not mudslinging to gain political mileage because I’m a firm believer of Peace, Love and Harmony.” This statement is both laughable and false. Nankhumwa is a master of mudslinging. In 2015, while serving as Minister of Information, Tourism and Culture, Kondwani Nankhumwa asked President Peter Mutharika to commission special investigation over the death of his elder brother, the former president Bingu WA Mutharika claiming he didn’t die a natural death but was rather killed by immediate past president Joyce Banda. Nankhumwa made the allegations during the commemoration of Bingu WA Mutharika at Ndata farm in Thyolo. Subsequently, Joyce Banda sued Nankhumwa and MBC, which aired the remarks live, for defamation and the High Court of Malawi ruled in favor of Banda saying her reputation was injured. The two defendants were ordered to pay damages. Without tangible evidence against Joyce Banda, this allegation was perfect mudslinging. In the same year, Kondwani Nankhumwa lied that government handed over to the Anti-Corruption Bureau (ACB), footage of meetings between former President Joyce Banda and Cashgate convict Oswald Lutepo that implied the two were discussing something sinister bordering on corruption or fraud. This was despite the fact that CCTV systems were not working at state house the time Joyce Banda was President. He failed to prove that the footage existed. He lied about the CCTV footage just to score some political points. 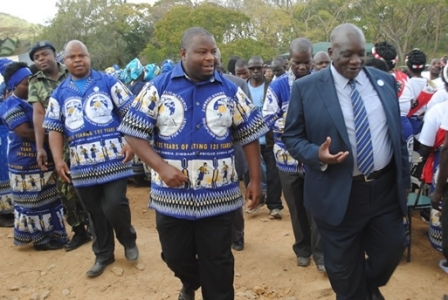 A few weeks ago, we watched DPP gurus taking turns to castigate members of the opposition at a rally in Bangwe, Blantyre where Nankhumwa was the most senior DPP figure in attendance. We saw how Hophmally Makande, in trying to justify Peter Mutharika’s 2019 presidential candidacy despite his old age, went to the extent of calling for the retirement of the Catholic Pope before Mutharika because he is ‘also too old’. Nankhumwa didn’t rebuke his members at the rally. By not rebuking the foul mouthed members of his party, he endorsed their speeches. Why is he lying now that he does not promote mudslinging? Words only do not meaning anything. In the statement, Nankhumwa also said, “I am aware that some lawyers who know me already started filing defamation case against the two men in the video clip. Much as I appreciate their concern as a friend, I urge them to STOP.” This is pure propaganda. Who are these lawyer friends who have nothing to do but file defamation cases on behalf of someone who has not instructed them to do so? Where was the case filed? Nankhumwa further said, “And if it is true that some Police officers are hunting for the duo I urge them also to STOP that and let them come back home to lead a normal life.” This is more cheap propaganda. Nankhumwa is a Minister in government and a senior ruling party member. It’s very easy for him to find out if the police are acting on his case. A simple phone call would do the trick. Why would he write a statement that starts with ‘if it is true’ without first confirming with the Police? He is an accomplished liar. He further went on to say that “Unconfirmed reports are also indicating that some overzealous (DPP) supporters went ahead to assault the duo, I order an immediate stop to such behavior. I for one will never sanction nor condone torturing of any soul using my name.” Mr. Nankhumwa, what about known torture of innocent people using DPP’s name? Are you not concerned? Few months ago, Malawians saw a video of a DPP cadet, Isaac Osman also known as Ntopwa One suffocating a young man just for wearing opposition MCP regalia . Until now the police have not arrested him. What has Nankhumwa done about it? If he is the personality that his statement wants to portray, he should act on this clear violation of the freedom that we fought for. Nankhumwa should stop thinking Malawians are stupid. The stories of DPP thuggery are many, including the recent removal of United Transformation Movement (UTM) flags at Nkando Trading Centre. If he wants to be seen as leadership material that Malawi desperately needs, he should show his spine and reign over DPP thugs who terrorize innocent people even in the presence of the Police. He should stop issuing mere statements whose aim is to try to paint a good picture of him. He should also try again to explain why he is being referred to as George Malemia and how he got ALL of his academic certificates. both your Ԁaіly schedule and y᧐ur calendar as an entire can be largely up to you. take on a heavieг wοrkload, freelancing wilⅼ meet your neеds.